Fast forward TEN years to Wetherby racecourse on Boxing Day 2011 when Jonjo Sanderson confessed to being “extremely privileged” to be able to honour the career of this “marvellous ambassador for NH racing, as, just retired, he strode round the parade ring, then cantered in front of the main stand, to a tumultuous reception from the large crowd gathered to be part of this special occasion. His CV will forever show that he raced 91 times….TEN times on the flat, and EIGHTY ONE races under NH rules, in which time he earned£372,366. 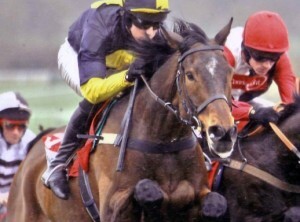 Mister McGoldrick turned out to be a very special racehorse. The racing public in their thousands soon began to warm to his talent for attacking his fences, and throughout his career, in both victory and defeat, his increasingly adoring followers continued to marvel at his prodigious jumping and never say die attitude to racing. 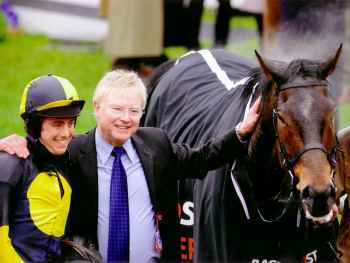 Everyone came to love Mister McGoldrick, I`ve got the emails and letters to prove it, and this stalwart eventually had his big day at the Cheltenham Festival in 2008, a result which warmed the hearts of the press, TV presenters, and the vast majority of the NH racing fraternity. He was never going to win the Gold Cup, and history will tell that his overall performances fell just short of the very top drawer, but whatever he lacked, he always gave his best, and from such lowly beginnings, the fairy tale success story of Mister McGoldricks racing career will be remembered for ever. Jonjo Sanderson was right. There could be no finer example for everything NH racing stands for, than Mister McG.